Simple & affordable. Learn about the price for each of Toptask's categories. The price of each task depends on the category of task booked. The below table reflects the tasks included in both categories. Employers may choose either an hourly price or a fixed rate when posting a task. *This price includes the service fee and VAT. *This price includes a 20% service fee and VAT. An admin fee of £2.50 per task inclusive of VAT will be added on check-out. *A 20% service fee and VAT will be added to your chosen rate. An admin fee of £2.50 per task inclusive of VAT will be added on check-out. Toptask will only release the funds once the task has been successfully completed by the student and confirmed by the employer. A percentage of the service fee is invested into a scholarship programme that gives young people from all backgrounds the chance to attend university. Find out more in our here. Read our full FAQs here. Why do I need to pay upfront? Toptask asks you to pay upfront in order to avoid unnecessary exchange of personal data, as well as to protect the interests and privacy of both you and the student. Yes. VAT is included in both the transaction fee and the admin fee. What are the service and admin fees? 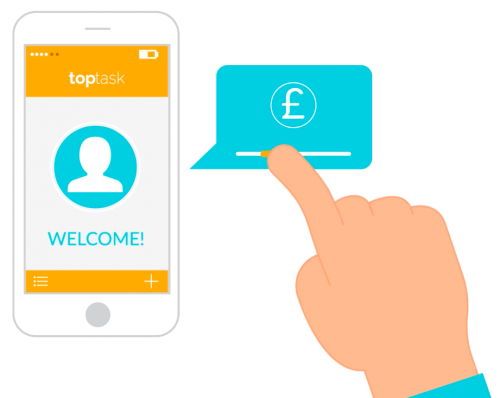 Toptask charges a small service fee. A percentage of this fee is invested into a scholarship program to encourage the underprivileged to access university. Admin fee covers all transaction costs such as PayPal. How do I pay the student? Payments are processed by PayPal and Braintree. The transaction will be taken from your account once you have accepted a student to hire and the student gets the money once the task is completed. Like the idea? Share with a friend! ©2017 S2DNT UK Ltd, All Rights Reserved. Get our mobile application to access skilled and trusted university students.